Our luxurious Shea Butter Face Soap contains the same amounts of shea butter and cocoa butter as our terrific Hand Repair soaps. We make our Facial Soap without ground herbs for a smoother and softer bar for sensitive facial skin, great for moisturizing and softening your facial skin. We select lighter fragrance intensities for our face soap. We make our Shea Butter Facial Soaps in ten light fragrances, plus Unscented. Our Black Tea and Berries Shea Butter Soap is another light and unusual fragrance blend. This light blend of honeydew and berries was the first Shea Butter Facial fragrance we ever made, and still one of our most popular. Our Grapefruit and Bergamot fragrance blend is icy and cool, yet gentle and fresh. Scented with Lavender Essential Oils, our Lavender Shea Butter Facial Soap is a 100% Natural Soap. Rosacea Soap natural remedy for Rosacea for that frustrating pink blush or flush that affects delicate, sensitive skin. If you prefer a vibrantly scented facial soap, Rosemary Mint Shea Butter Soap might be right for you. Three slices of our incredible handmade Shea Butter Facial Bars: Lavender, Grapefruit Bergamot and our new Mediterranean Fig. Six full size bars in a tall Cellophane Bag, including Lavender, Dewberry, Grapefruit & Bergamot, Rosemary Mint, Avocado-Birch-Eucalyptus, and a Tea fragrance. A beautiful gift anytime of the year. 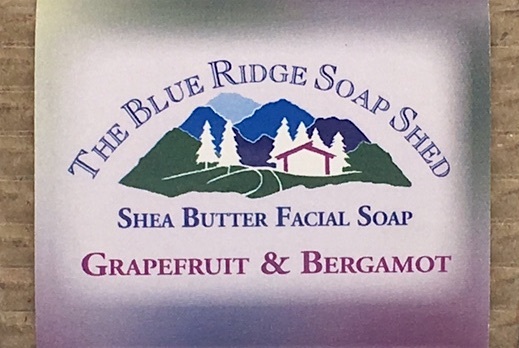 Three of our super-moisturizing Shea Butter Facial Soaps, Lavender, Dewberry and Grapefruit & Bergamot. Tuberose is a strong, yet exotic floral fragrance for our Shea Butter Facial Soaps. White Tea is a light fragrance for our Shea Butter Facial Soaps, with a slight floral twist.